So I'm pretty proud of myself for this one: I started making my own California rolls! Ever since I realized I could pretty easily keep all the ingredients I need on hand, this Americanized maki recipe has gone into regular rotation. Krab sticks can be frozen; unripe avocados last for weeks in the fridge; sushi rice, nori, sugar, and rice vinegar all keep in the pantry. 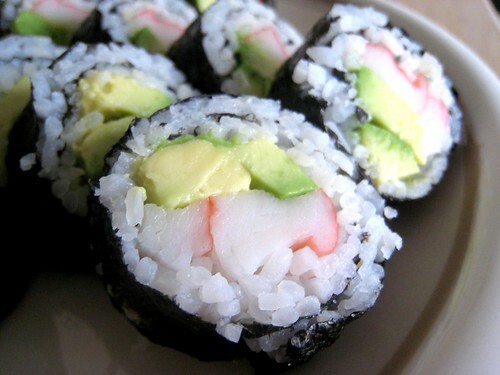 The method is about the same as when I made avocado maki. 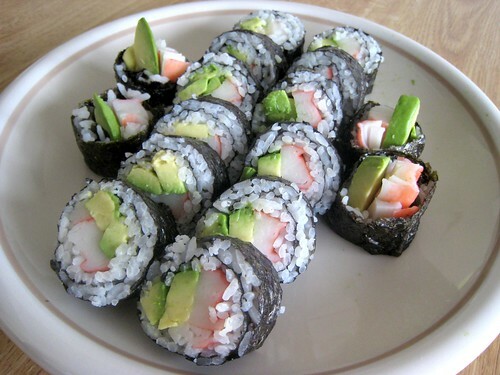 Mix freshly cooked sushi rice with a bit of rice vinegar and sugar (about seven ounces of rice is good for two rolls) and let it cool; spread half the seasoned rice over one full sheet of nori; lay avocado slices (about one quarter) and a krab stick (split in two, lengthwise) across the middle, and roll it all up using a mat (or if you're like me, your fingers). Lay the roll seam-side down, slice into eight pieces with a sharp knife, and repeat. Have wasabi and soy sauce for dipping on the side. By the way, two rolls makes a really substantial meal, so depending on my appetite I often cut down on the amount of rice. (For some reason I can't bring myself to make just one roll at a time.) And while my kitchen is definitely no Sushi Yasuda or Masa, making this stuff at home means I can wean myself off of buying supermarket or takeout sushi in moments of desperation. *And if you're curious, that comes out to about 485 calories and 11 grams of fat. Compare that to five or six bucks per pack of eight for takeout California rolls, and I save myself about eight or ten dollars every time I have a maki jones. Yes! mmmmm . . krab sticks. makes the world go 'round! Nice! I can never roll mine prettily. Great pics too. heyhey! very pretty rolls! now i'm going to read your soysauce, tea egg entry! i love that shite, can only get it at my momma's, and only if i remember to request it. stuckinny—thanks! Haha, I read your screen name as "stuck inny," for some reason reminding me of bellybuttons. It's amazing how much sushi take-out costs...yours are pretty and probably fresher.